Includes: If culture is positive, identification will be performed at an additional charge (CPT code(s): 87077 or 87143 or 87147 or 87140 or 87149). Methodology: Bacteriologic culture. Aerobic includes routine isolation and identification procedures. Antibiotic susceptibility testing when appropriate. Clinical Significance: Culture of the nose (as opposed to nasopharynx) is primarily for the detection of Staphylococcus aureus. The significance of other organisms is difficult to assess since this site and its discharges can easily be colonized by a variety of organisms. 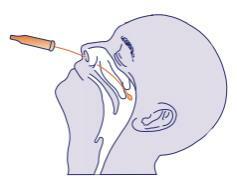 Instructions: Collect specimen using a mini-tip culture swab transport device. Indicate source of specimen on both the requisition and specimen transport device. After collection, immediately transport specimen to the laboratory for viral testing and viral antigen detection. Indicate source of specimen on both the requisition and specimen transport device.